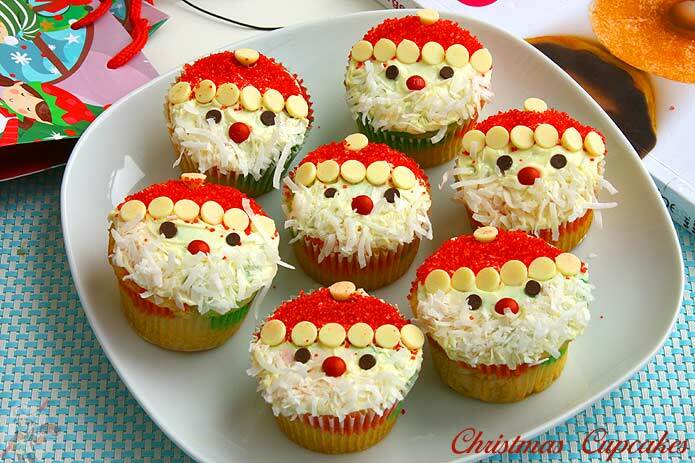 Are you looking for easy Christmas Cupcakes recipe? I have got it covered – hang on! ‘Tis that time of the year! Ovens working over time creating amazing Christmas themed baked treats one after the other. The cookie swaps, the pot luck parties, the office get togethers, the school parties. Whatever the party is, the main focus is on the food especially desserts! Cookies, cupcakes, muffins, scones, cakes, fudges, truffles the list goes on. Christmas themed desserts can be as simple as using red, green and white colors in the form of sprinkles, colored sugar, candies or very elaborate too. I’m neither lazy nor over enthusiastic. I like to try different recipes, bake new things. I have patience to some extent but definitely not a lot to do elaborate desserts or spend a lot of time decorating it. I love simple ideas which look great that does not require a lot of work. You can check out here for simple cake decorating ideas here. So for me Christmas cupcakes and cookies are the two things which can be baked in a jiffy and can be dressed up easily to look good and give an impression as if one has slogged for hours. Now who doesn’t like that! There was this pot-luck party in my son’s class. Went through the list of things the other kids were bringing and I saw that cupcakes were missing. So I offered to send in cupcakes and being Christmas I decided to make Christmas themed cupcakes. Searched Pinterest for “easy Christmas cupcakes” and was floored by the results! Snowman cupcakes, Rudolph cupcakes, gingerbread cupcakes, the list was becoming too cute and too long. That was a lot of ideas. Didn’t know which one to choose and which one to leave. Once I saw the Santa cupcakes the decision became very easy, especially after seeing the instructions. It was a classic example of “if-I-can-make-these-anybody-can” Santa decorations. I knew it will become an instant hit with the kids because of the cuteness factor. Now had to finalize the cupcake recipe. 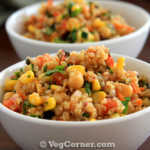 I decided to try a new recipe instead of the eggless cupcake recipes already in the blog. I have always wanted to try the cake mix-soda combination eggless cake recipe for years now. It is such a simple recipe! 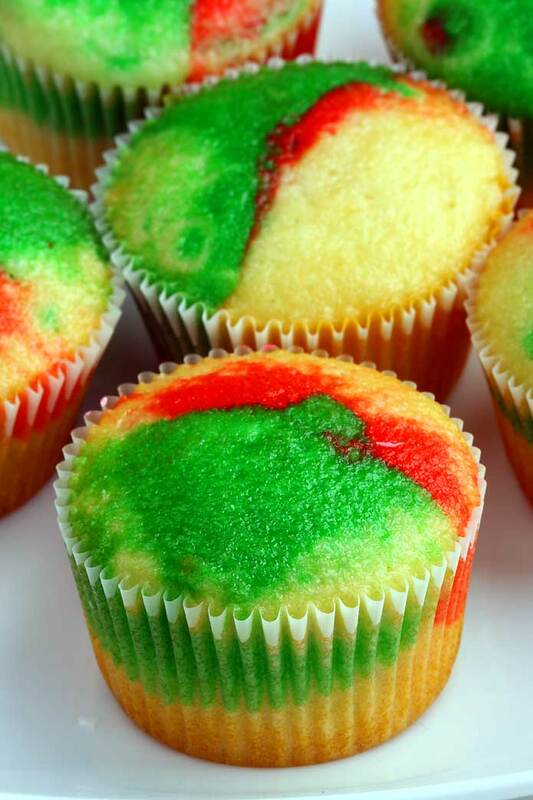 Just mix a pack of cake mix and a can of soda (any flavor) and bake it as cake or cupcakes. Don’t need for any other ingredients such as oil, butter, water, eggs nothing. Simply cake mix and soda is all you need. 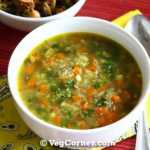 I was too skeptical of this recipe and that’s one of the main reasons that I kept postponing it. But decided to try it this time. It didn’t fail me. It definitely works! But I would make some minor changes the next time I use this recipe. 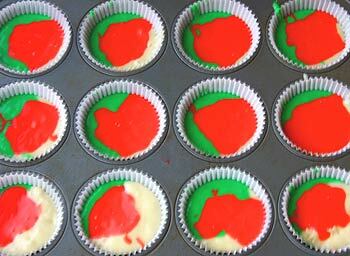 Also got the idea to make it more “Christmassy” by doing a multi-colored cupcake using Christmas colors red and green. 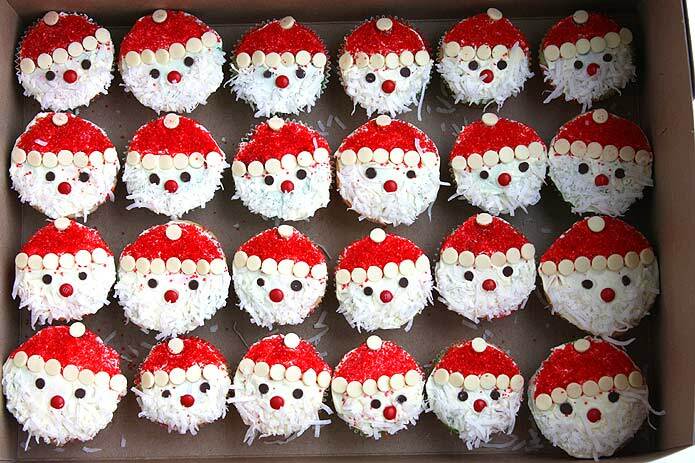 It’s Christmastime and what better time than now to make these cute Santa Claus cupcakes! The base for this Christmas cupcake is a very easy recipe too. Just uses two ingredients to make this recipe. Yes you heard it right. 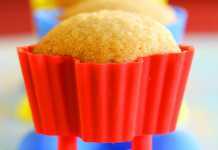 Just 2 ingredients to make these airy, feather light cupcakes. Preheat oven at 350F/180C. Line a 12-cup muffin tin with paper liners and lightly grease it with non-stick cooking spray. In a large bowl beat together the cake mix and soda. Beat for about a minute and a half. Divide the batter into 3 portions. 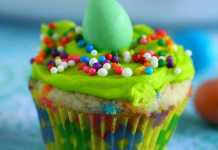 Mix in red food coloring in portion, green in one portion and leave the other one as it is for white color. 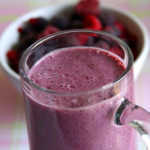 Fill each cup with a tablespoon of batter of each color. Each muffin cup should be about 2/3rds full. Bake it for about 18-20 minutes or until a toothpick inserted in the middle comes out clean. Cool the cupcakes in the pan for at least 10 minutes before removing it out of the pan. Let the cupcakes cool completely before you can frost it. I felt that the cupcakes were too light, tender that it might not hold it’s shape if it is baked as a cake and you intend to slice it, make shapes out of it etc. 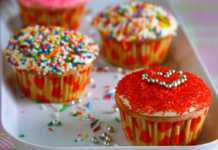 For cupcakes it should not be a very big problem because you are not going to slice it. Actually even for that a few of the cupcakes were sort of lightly crumbly. I’m guessing it is because of the soda. The next time I follow this recipe I’m going to try reducing the quantity of soda and see if it’s better, especially for making cakes. The above recipe is for 1 pack. I used 2 packs of white cake mix to make 24 regular size cupcakes. I was able to get additional 12 mini cupcakes for the remaining batter. I did not have the proper red food color so it looked more like pink than red once the cupcakes were baked. 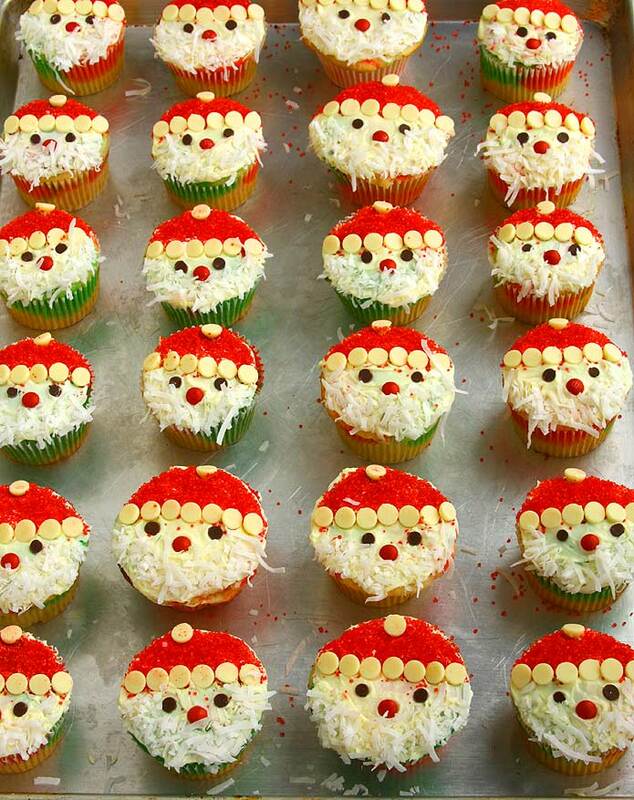 For the Santa Claus decoration idea: I used store bought icing to frost the cupcakes. But if you want to make you own you can try this Vegan Buttercream frosting or vegan cream cheese frosting. Next RecipeThe Best Red Velvet Chocolate Chip Cookies Ever! 1.Which cake mix brand can I use for all the recipes that call for cake mix? 2. Also what is cake flour you are referring to? Is it the same as cake mix? Any brand cake mix should be fine as long as the measurement is the same. Cake flour and cake mix are different. 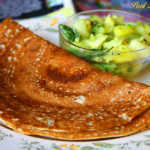 Cake flour is soft wheat flour which is used to make delicate pastries right from scratch. Cake mix is ready to use. All you have to do is add liquid ingredients like water/milk, oil and eggs, and bake it.